Staff photo by Steve Muscatello New Ulm second baseman Jackson Bode looks to catch the ball as a Willmar runner slides into second during Gold’s win Thursday at Mueller Park in New Ulm. NEW ULM — New Ulm VFW Gold scored three runs in the bottom of the fifth to erase a 3-2 Willmar lead to come away with a 5-3 win at Mueller Park. The game was stopped in the top of the sixth due to heavy rains. Teddy Giefer got the win for New Ulm. He went into the sixth inning and allowed four hits and fanned three. Jeff Salonek took the loss for Willmar. Nolan Drill and Mason Cox each had two hits for New Ulm. New Ulm started its rally in the home half of the fifth when Jace Marotz reached on a two-base throwing error. A one-out base hit from Cox scored Marotz for the tying run. Tony Geiger followed with a single before Cole Backer laced a double for a 5-3 lead. 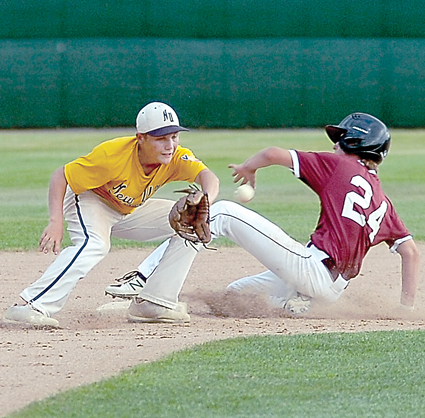 Gold, who hosts Dassel at 10 a.m. Saturday at Mueller Park in a doubleheader, took a 2-0 lead in the bottom of the first. Cole Ranweiler doubled and Marotz followed with a single. Drill’s base hit scored Ranweiler and a fielder’s choice brought in Marotz. Willmar took advantage of two Gold infield errors to score two unearned runs in the top of the third. Andy Baumgart and Jack Roechl each reached on consecutive errors to start the inning. A Tanner Baumann sacrifice bunt and two singles knotted the game. Willmar took a 3-2 lead in the fourth on a walk, two stolen bases and a double from Dylan Arndorfer.